These quilts are from our book, The Best-Ever Applique Sampler, which is available in book and eBook formats. Click here to find it at pieceocake.com. The Best-Ever Applique Sampler is full of detailed applique instructions and clear, sharp photos. It has nine, 14″ blocks that can be made as individual small quilts or that can be combined into larger quilts. Instructions are included to make the larger quilts shown on this page. The Garden At My House from the book The Best-Ever Applique Sampler by Becky Goldsmith & Linda Jenkins. Quilt by Becky Goldsmith, quilted by Linda Jenkins. The Wreath Quilt from the book The Best-Ever Applique Sampler by Becky Goldsmith & Linda Jenkins. Quilt by Linda Jenkins. Blowin’ In The Wind from the book The Best-Ever Applique Sampler by Becky Goldsmith & Linda Jenkins. Quilt by Becky Goldsmith. Pretty Perky from the book The Best-Ever Applique Sampler by Becky Goldsmith & Linda Jenkins. Quilt by Becky Goldsmith. Cotton Flowers from the book The Best-Ever Applique Sampler by Becky Goldsmith & Linda Jenkins. Quilt by Linda Jenkins. 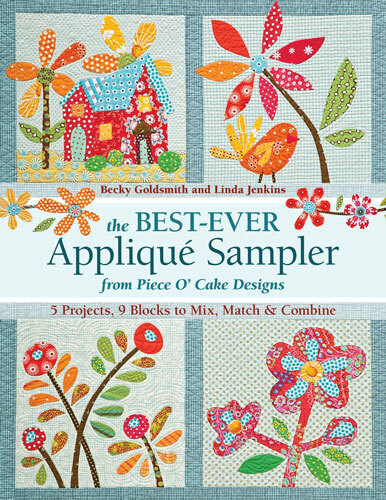 Best-Ever Going Home from the book The Best-Ever Applique Sampler by Becky Goldsmith & Linda Jenkins. Quilt by Linda Jenkins. Flower Wreath from the book The Best-Ever Applique Sampler by Becky Goldsmith & Linda Jenkins. Quilt by Linda Jenkins. Vase of Flowers from the book The Best-Ever Applique Sampler by Becky Goldsmith & Linda Jenkins. Quilt by Linda Jenkins. Leaves from the book The Best-Ever Applique Sampler by Becky Goldsmith & Linda Jenkins. Quilt by Linda Jenkins. Big Flowers from the book The Best-Ever Applique Sampler by Becky Goldsmith & Linda Jenkins. Quilt by Linda Jenkins. Round Flowers from the book The Best-Ever Applique Sampler by Becky Goldsmith & Linda Jenkins. Quilt by Linda Jenkins. Bird Block from the book The Best-Ever Applique Sampler by Becky Goldsmith & Linda Jenkins. Quilt by Linda Jenkins. Flower from the book The Best-Ever Applique Sampler by Becky Goldsmith & Linda Jenkins. Quilt by Linda Jenkins. Becky, I have never appliquéd before, so I have been watching a lot of “You Tube”. The videos you have done, I have really enjoyed. I have learned more from your videos than all the others put together. You are such an excellent teacher! I have only been quilting less than 2 years and have learned most of what I know either on You Tube or reading. But I have to say, you are one of the best teachers I have ever seen. I know you have put a lot of time into teaching newbies like me, and I wanted to let you know how much I appreciated it. Please keep up the good work! This probably isn’t where I should put this, just hoping you receive it. Thanks again! What a lovely note! thank you for letting me know the you are enjoying the videos! I hope that you continue to love your appliqué!